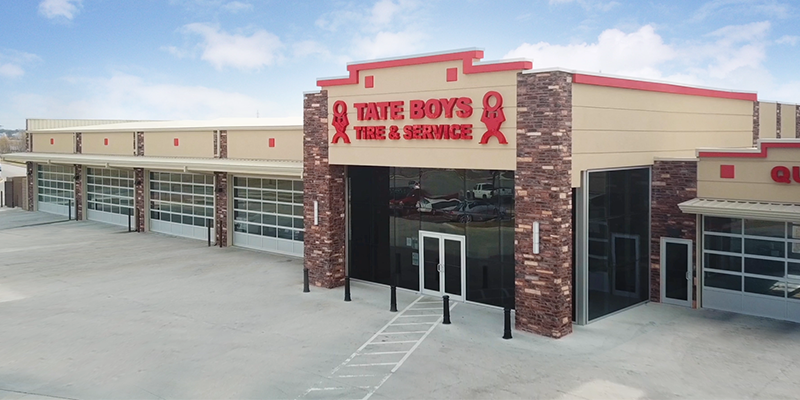 A Tate Boys Tire & Service location in Catoosa, Oklahoma. Walk into a Tate Boys Tire & Service location and you can tell that they do things a little differently than other shops. Employees move a little faster. Their hands are clean and shirts tucked in. Most of all, they seem to enjoy what they’re doing. For Tate Boys, our Tire Review 2018 Top Shop Winner, running a multi-store tire business is like operating a professional sports team. At each location is a high-functioning team, rooted in cross-process training and non-negotiable expectations. A “playbook” approach that can be replicated across locations helps ensure the highest level of customer care, quality and speed. Managers (i.e., “team captains”) at each location keep the teams on task and on time. “Strategic coordinators” along with the “head coach” at the Tate Boys corporate office and training center make calls using real-time data based on integrated software to evaluate the effectiveness of each team/location and provide support from the sidelines. Tate Boys operates its locations from a separate headquarters that includes a robust training center complete with manikins showing the proper way to wear the Tate Boys uniform, plus offices for support staff and conference-room areas. Hiring for the seven locations of Tate Boys Tire & Service is focused on recruiting “A Players,” preferably with a team-sport background. They look for people with emotional intelligence and the ability to work as a team, going so far as to incorporate Wonderlic testing in their pre-hire screening. The guiding principles of each team and its players are six shared corporate values, acting as a North Star to guide the direction of the Tate Boys business and each employee. Tate Boys’ Core Values hang on the walls at each location, outlining the qualities that go into institutional excellence. Teams also do morning huddles, where employees are often challenged to find ways to dig deeper into a specific Core Value. For example, finding ways to improve… to have more fun… to better serve others, etc. Challenging employees also means leadership and management teams must consistently lead by example. 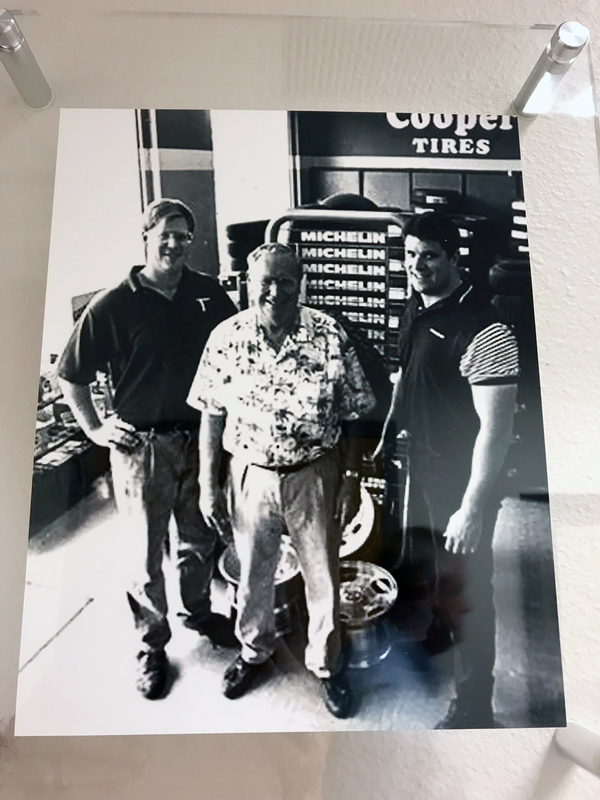 For founder and patriarch Bob Tate, early success as an independent tire dealer was rooted in Core Values #1 and #2 – making it about others and serving with passion. After 30 years with OTASCO (Oklahoma Tire and Supply Company), Bob retired, but he missed taking care of his customers. Two years into retirement, his wife encouraged him to get busy again, so he opened a two-bay gas station in 1988 in Bartlesville, Oklahoma called Bob Tate’s Tire. His sons, referred to as “the boys” in their small town, worked in the shop and pumped gas when they weren’t in school. Then in 2000, brothers Craig, Chuck and Curtiss Tate bought the business, renaming it Tate Boys Tire & Service. 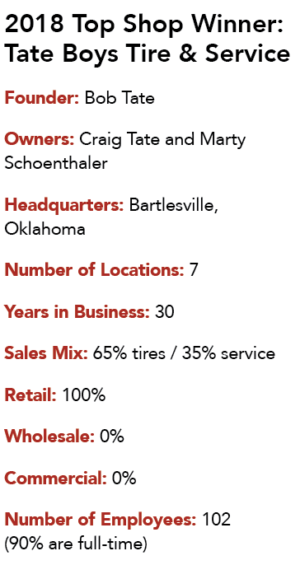 Soon after, Curtiss moved on to start his own retail tire business, Curtiss Tate’s Tire & Service, with two locations about an hour outside of Bartlesville. A vintage photo of Bob Tate with his boys, Chuck (left) and Craig (right) inside the original Bob Tate’s Tire. Craig and brother Chuck stayed on and built the business, adding more locations with the continued support of their father, who passed away in 2015. 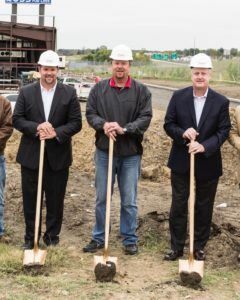 As the business grew, the brothers realized that further expansion was more than they could manage on their own (Core Value #6), so in 2016, they recruited A-Player Marty Schoenthaler to join the family business as CEO, after he left a high-profile role as Chief Information Officer (CIO) of Archer Daniels Midland Co., one of the largest companies in the world. A native to Bartlesville after 10 years as an executive with ConocoPhillips, Marty became friends with Craig while coaching their sons in peewee football. When the Tates realized they needed a CEO to help take the business to the next level, Marty was tapped to become the team’s head coach. Despite changes, both Chuck and Bob’s legacy of service to others remains the foundation upon which Tate Boys Tire & Service has grown. When starting out, Craig and Chuck found that having former athletes as new hires worked best because the person had a foundation of putting in the work, following instruction, supporting others and working as a team to achieve a common goal. Plus, they knew how to hustle. Increasingly higher volumes of tire sales also made standardization of practices a necessity to keep efficiency high – a concept Craig learned from working a second job at UPS during the early years of his career to supplement his income. Craig took that culture of efficiency at UPS and adapted it to their tire bays. Procedure and process are now a key part of the Tate Boys playbook. This attention to detail and to process has helped Tate Boys Tire & Service work faster, taking care of their customer’s need for speed. Having standardized processes also helped keep operations moving forward with the loss of Chuck Tate last year (see page 28). According to owners Craig and Marty, time is the new currency with consumers. It’s what consumers increasingly value most – getting problems solved quickly so they can get on with the rest of their day. Speed is a key metric in the Tate Boys approach. Visit TateBoys.com and you’ll see the average wait times across locations. Their approach of multiple team members working on a vehicle at the same time helps shave time off the clock – a clock that starts ticking as the vehicle is pulled into the bay. For the Tate Boys team, every second counts – so much so that new technology such as walk-away autonomous tire-changing equipment isn’t of interest because it’s too slow compared to traditional methods. Even some Tire Industry Association suggested practices are too slow for the team. With the right processes in place with well-trained consistency, speed is not at the expense of safety. Units sold and profits matter, yet time is how they keep score. “[Time] is a great differentiator because in this industry, [a customer] can go get tires in a lot of different places, but that experience – especially if time is important to her because she has kids, she’s got to run them to practice and all that – time is a big part of our business model,” says Marty. Because of their time-saving focus, the team at each Tate Boys location acts more as a pit crew than individuals secluded by bay. The goal is to have customers in and out for tires in 30 minutes or less. Wait times are updated at each location every 15 minutes on the company’s website. The clock starts when the customer is logged in at the counter. Customer wait times and other key business metrics are monitored via TireShop by Freedomsoft, a point-of-sale software designed for tire and auto service locations, integrated with DOMO, a cloud-based data management and visualization tool. This allows the company’s leaders to keep the pulse on the speed of both technicians and bays at each location in real time (every 15 minutes) in addition to other important metrics. Craig and Marty could run the business from their phones if they needed to with shared performance dashboards they’re able to view across devices (phone, desktop computer, tablet, etc.). Where Craig, a finance major, used to crunch numbers from spreadsheets each night to gauge performance, now he and Marty have the information they need to effectively manage the multi-location business through an app on their phones. Craig says that his brother Chuck was a huge influence in developing the rich culture that is now ingrained in Tate Boys Tire & Service. When it comes to serving with passion, Chuck personified it. 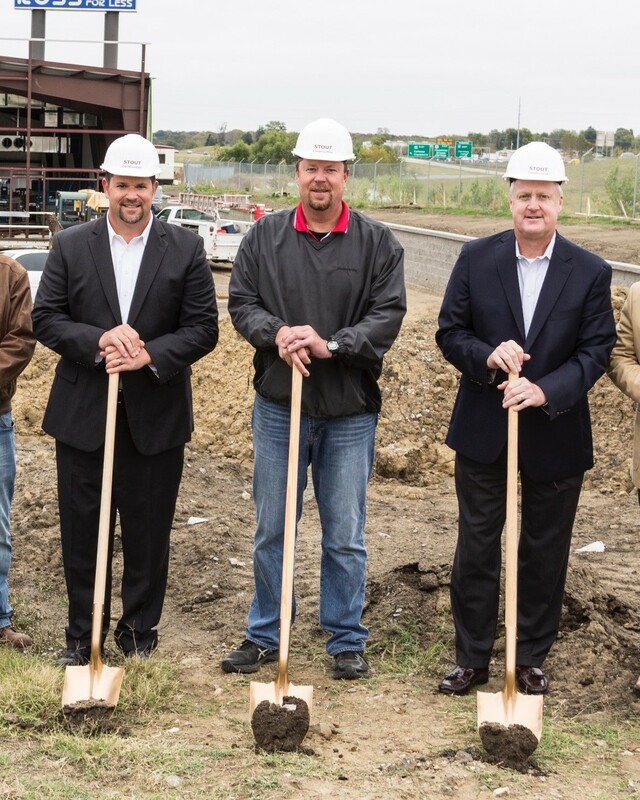 Craig Tate (left), Chuck Tate and Marty Shoenthaler at Tate Boys Tire’s ground breaking for its Catoosa, Oklahoma location. 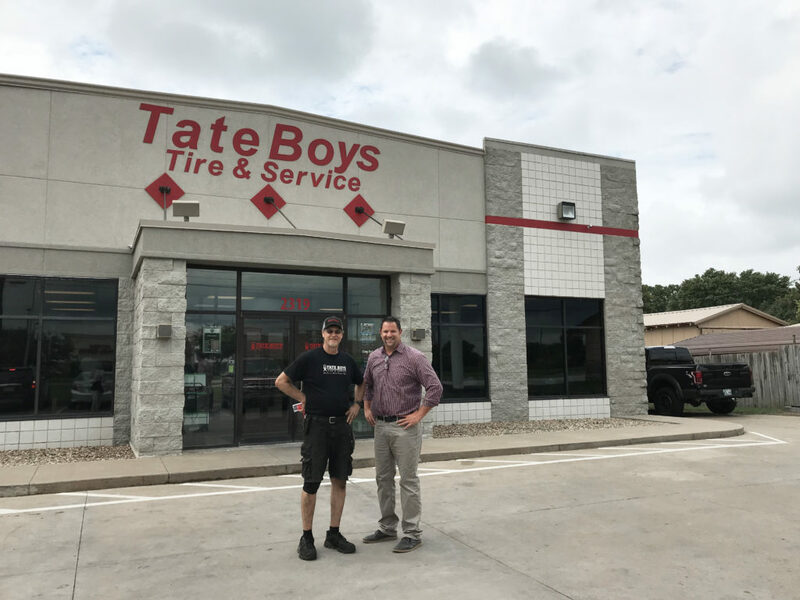 Tate Boys Tire & Service will often “hire the smile,” prioritizing attitude over aptitude, training people up based on the Tate Boys playbook and way of doing things. To confirm someone is the right fit for the Tate Boys team, the company’s pre-hire assessment includes Wonderlic testing, a group of intelligence tests made famous by the NFL that helps identify a person’s strengths and “soft skills.” Tate Boys designed their test format to drill into an individual’s emotional intelligence, which is an important aspect of their shop culture. 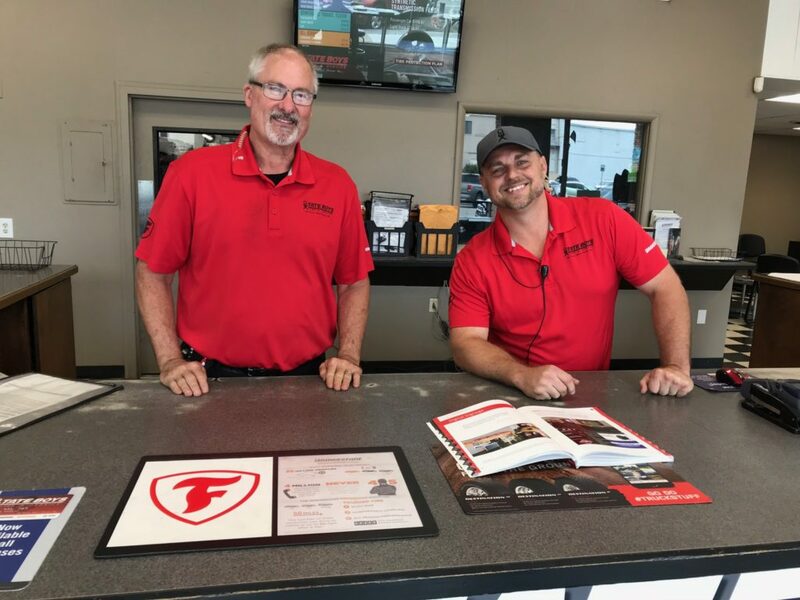 Marty has a mantra, “Hire slow; Fire fast.” The Tate Boys talent-acquisition process is more complex than most tire dealers, but the result is a stronger operation filled with individuals that have a passion to help others. While Tate Boys considers itself a “family business,” being in the family doesn’t actually mean things will be easy for you. A prime example is brother Chris Tate, who returned to the family business in July. Even though he worked in the shop when he was young and owned his own restaurant in Portland, Oregon for many years, Chris still has to start from the bottom up, just like everybody else. That foundational training is part of the culture. “He’s changing oil today,” said Craig about his older brother. “He’ll be back there for six months. He’s got to learn the business. He’s got another 90 days working as a tire tech. Then he’ll work 90 days as a mechanic with the other mechanics before we ever move him up front. Having family members working together in a growing business offers its own set of challenges. To minimize the potential of favoritism, Tate Boys has a “no nepotism” policy: No family member can report to another family member. This helps to minimize any inkling of preference, which can impact morale. Being part of the family also means being held to a higher standard. It also may take them longer to climb the ladder. If two people are up for a promotion and the family member and the other person have the same skills and quality, they will go with the other person. Both Marty and Craig agree that the tire business is hard, but it’s not complicated. The “fun factor” (Core Value #3) helps with day-to-day redundancy – and the fact that most customers coming into the shop don’t necessarily want to be there. Craig says they consistently look for ways to show appreciation for their employees. Those may include team-building activities such as tire rodeos with teams from different locations competing against each other or hosting a big company Christmas party to simply doing breakfast on Saturdays. Even the music choice in the shop creates a fun environment to break the monotony. In-store fun also includes friendly banter between employees and customers. With roots in the original Tate Boys culture, kidding around with people helps maintain a fun, positive atmosphere and creates better engagement with customers. Known for a quick smile, a corny joke and speedy service, the team at Tate Boys lives the Core Values of the organization on a daily basis – especially the fun part. Beyond the banter is the emphasis of connecting with each customer on a more personal level. Topics and details of customer interactions can be saved in the TireShop system, so on their next phone call or visit, a big red box will pop up on the screen, reminding the person at the counter the details of an earlier interaction. Notes include lighter details, such as personal interests, their child playing in the Little League World Series, a favorite sports team and more. It also can provide reminders of how a challenging customer wants their vehicle treated so extra care can be taken. Developed by Freedomsoft at the request of Tate Boys, this note tool is now a standard feature of the Tire Shop platform. “We don’t commoditize the product. If you come in and say you need an oil change and an inspection because you’re taking little Johnny to college…we talk about that stuff, so now we can put that into your account,” explains Craig. In addition to process, managing customer impressions is another important part of their playbook when it comes to excellence. As Marty explains, it’s not about what you’re doing as much as it is about what the customer thinks you’re doing that matters most. Perception is their reality. As part of making it about other (Core Value #1) and delivering a higher level of customer service, Tate Boys policy includes nonnegotiable expectations for employee conduct, included as part of orientation and ongoing training. “We’ve got nonnegotiables all over, but something that we stress are the things you can’t ever do in view of the customer,” explains Craig, attributing the lessons to what he calls the “Disney Principle” reinforced by the company’s ongoing training with Ferrante, a Tire Review contributor. Some team members might question why they can’t eat on the job – especially as sometimes the teams will work through lunch to take care of customers. But if a person has been waiting 45 minutes for their vehicle and they look out to see people eating pizza, the perception is that the team is more focused on themselves instead of on the customer’s needs. Marty said that they might think, “No wonder it’s taking this long!” when the reality is that the team worked through lunch. He adds that if you’re focused on yourself while at the counter or in the bay – like sending a text or checking social media – then you’re also not focused on the customer. While some shop owners might find this to be a challenge to enforce, Marty says when you hire the right people who truly care about others and set those expectations early, the rest falls into place. Finding people to take the Tate Boys playbook to lead new teams in future locations also means developing those with management potential from the ground up. To accomplish this, Tate Boys developed its own “Manager In Training” (MIT) program. The goal is to attract college graduates with the right Tate Boys attitude into the program almost in its third year. 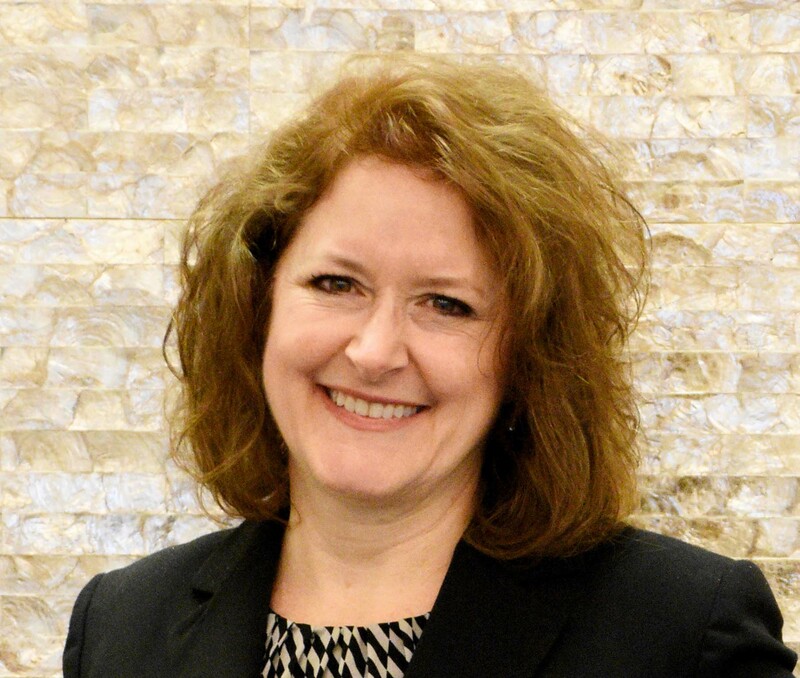 “If we do this right, then we’re developing those folks along the way. Craig has said it a hundred times, it’s not capital or even access to land to open new stores. It’s access to talent. The manager in training program is critical for that,” Marty says. Yet even those hired into the MIT program have to start from the bottom up. To Craig, that’s a key component to the program and the future success of the organization and its culture. For those roles, the company considers its competitors as ConocoPhillips and American Airlines, two of the largest companies in the area. When hiring and training your team according to the Tate Boys principles, doing the right thing (Core Value #5) should go without saying. Yet it’s a reminder to the team that each individual is empowered to take care of any customer concerns in the moment and without hesitation. The key to balancing customer care against “giving away the store” comes down to coaching. Thanks to the data tools, managers can see where there might be lower margins and more discounting so those areas can be quickly to be addressed. Those margins matter. As an added incentive for managers at each location to perform well, Tate Boys has a bonus structure in place that includes 10% of net profits. But the pay is usually secondary to the fact that they truly care about the success of that store and the care of its customers. Each location also sets its goals for the following year – a performance number that offers a profit target. The goal is to keep it simple while rewarding them for doing a great job. Continuous improvement (Core Value #6) is part of the Tate Boys culture. In addition to ongoing training opportunities, store managers have access to the shared data for each location, which creates some friendly competition. And if one shop or one tech is consistently running slow, they can get help or get even more training before the initial concern evolves into a bigger problem. When asked what they do to personally to continue to improve, both Marty and Craig said they read and find inspiration in other industries and from other tire dealers who they often network with in small group formats. Out of all of Tate’s Core Values, this one directly impacts them most. 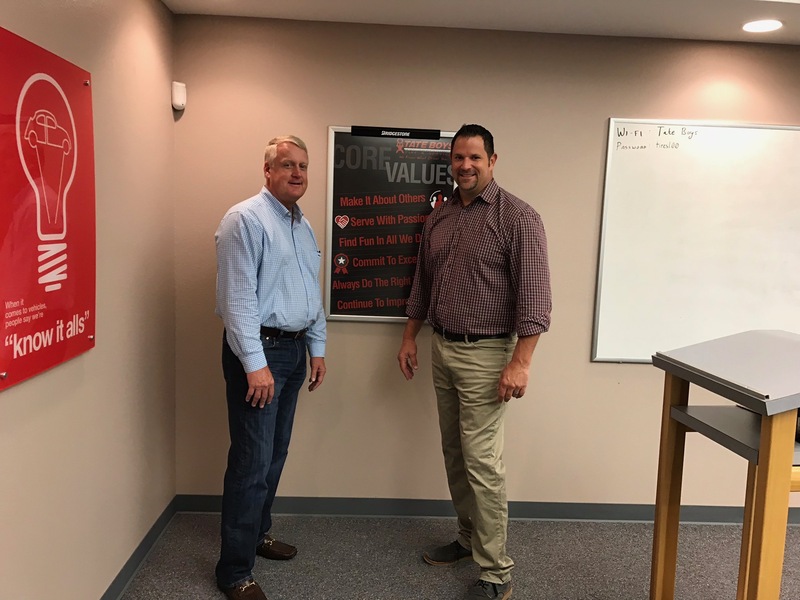 For Craig and Marty, the future of the business is to replicate the model based on their tried-and-true processes, training and values (now well rehearsed and documented) as a successful playbook to sell more tires and “around the wheel” mechanical service. But both agree that selling tires is secondary to making it a better day – a better experience – for those they serve. In fact, their mission statement is “Enriching Lives,” which reflects the Tate Boys approach to dealing with the customer as well as their team.